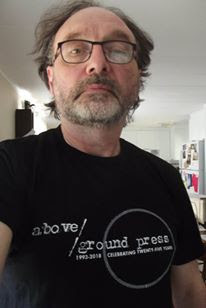 "The impact of above/ground press has been so great, some authors can’t remember a time without it." As part of its silver anniversary year, the above/ground press has produced a limited edition set of single-poem broadsides by an array of above/ground press authors. Curated by publisher/editor rob mclennan and designed by Christine McNair, the series will be launched by Sarah Mangold, Gil McElroy [pictured] and Sandra Ridley, who will be joined on-stage by rob mclennan for a conversation on the press’s twenty-fifth year. Moderated by Stephen Brockwell.